The decision to inscribe the sites on the list was made during the 34th session of the UNESCO World Heritage Committee in Brasilia on Saturday. Sites in Saudi Arabia, Australia, India, the Marshall Islands, and South Korea were also added to the list at the session. The mausoleum of Sheikh Safi ad-Din Ardebili, founder of a Sufism center in Ardebil, is located in the city of Ardebil in northwest Iran. It is comprised of structures built between 1335 and 1629 CE. The main part of the mausoleum, the Allah Allah Tomb, was built by Sadr ad-Din Musa, son of Sheikh Safi ad-Din Ardebili, whose descendant Ismail I founded the Safavid dynasty that ruled Iran during the 16th, 17th, and early 18th centuries. A wood box bearing inlays and intarsia, which is believed have been presented by Timurid king Homayun, has been placed on Sheikh Safi’s grave. The mausoleum consists of many sections that have served a variety of functions over the past centuries, including a library, a mosque, a school, an icehouse, a hospital, kitchens, a bakery, and some offices. It incorporates a route to reach the shrine of the sheikh divided into seven segments, which mirror the seven stages of Sufi mysticism. Various parts of the mausoleum are separated by eight gates, which represent the eight attitudes of Sufism. The site presents characteristics of medieval Iranian Islamic architecture. A collection of fascinating artifacts is also kept at the mausoleum. Another dome was constructed beside the main dome of the mausoleum after Shah Ismail I was buried beside the grave of Sheikh Safi. Several parts were gradually added to the main structure during the Safavid dynasty. A number of Safavid sheikhs and harems and victims of the Safavids’ battles, including the Battle of Chaldiran (also known as Chaldoran), have been buried at the site. One of the main trade centers on the Silk Road, the Tabriz Bazaar is located in the city of Tabriz in East Azerbaijan Province, northwest Iran. The history of the bazaar embodies a perfect traditional system of medieval Iranian Islamic trade. The Tabriz Bazaar flourished during the 13th century and retained its commercial and administrative status until 1548 when Safavid king Shah Tahmasp I moved his capital to Qazvin. 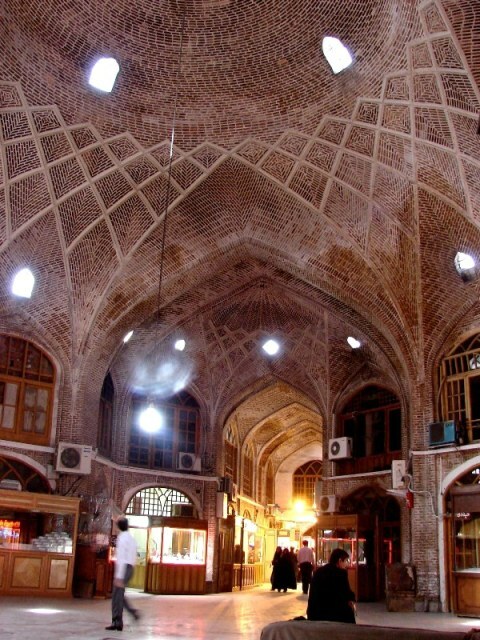 The bazaar comprises 23 caravanserais, 22 corridors, 20 malls, 28 mosques, 8 madrasahs, 5 bathhouses, 2 icehouses, and a zurkhaneh – an traditional Iranian sports club. The bazaar has been covered with vaults built with bricks.